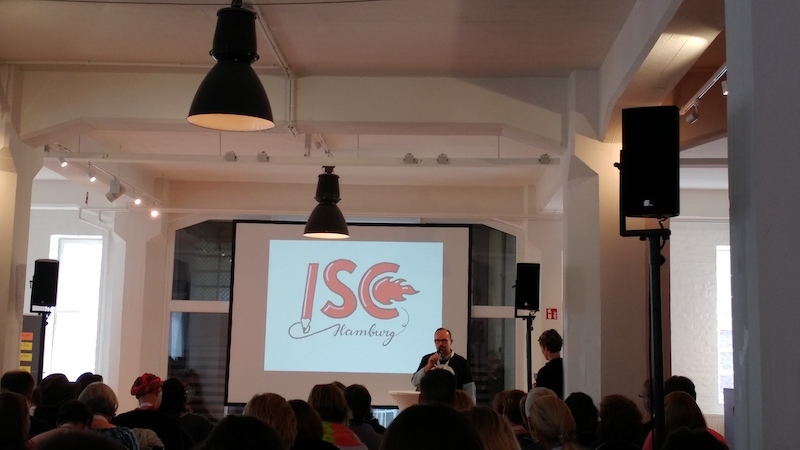 International Sketchnote Camp 2017 #isc17HH~ 3 min. 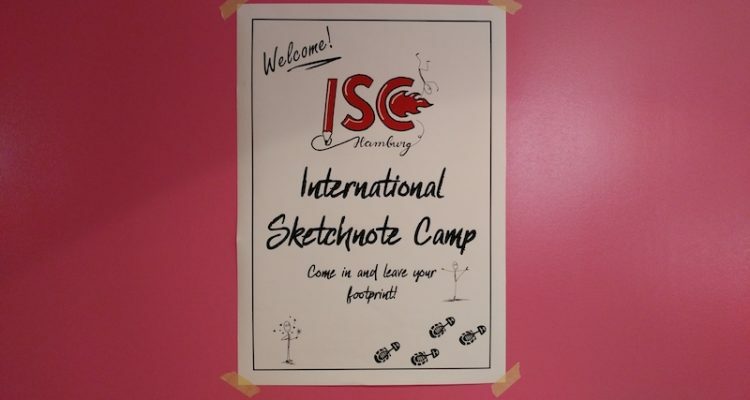 On the 23rd of September 2017 the first International Sketchnote Camp took place in Hamburg, Germany. 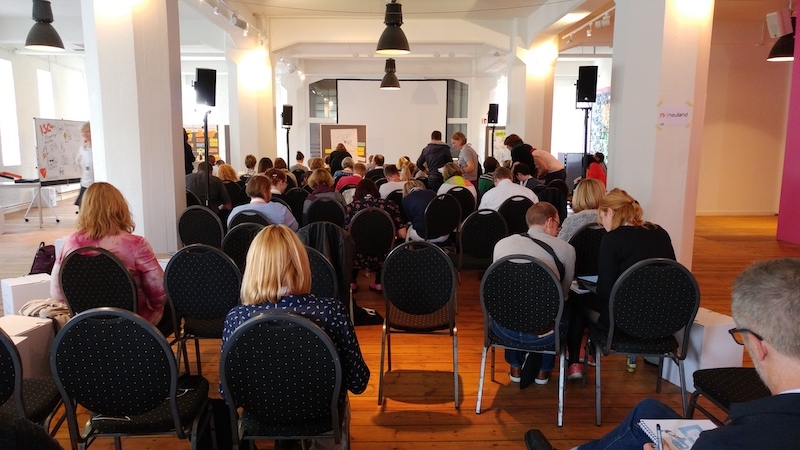 Well-known sketchnoters, authors, but also newbies gathered in the beautiful Dialoghaus to exchange their knowledge/stories/tipps. The barcamp style conference had around 150 participants from all over the world and the session board was full really fast with a lot of interesting sessions and workshops. Upon the arrival everyone got a goodie bag with the sketchnote selfie book (every participant was asked to make a sketchnote about himself) with the sketchnotes about all the participants, a sketchbook, some pens, stickers, postcards and a bag for pen(cil)s. Then you could pick up your camp t-shirt. The goodie bag and the camp t-shirt were designed by Mike Rhode and they are amazing! After the session planning, the camp started with a keynote from Mike Rhode. Mike thinks that everything that we do has an impact on the future. He motivated us to think about what we could leave in the life of others. Therefore these three things are essential: IMAGINE, CREATE, INSPIRE. After the keynote the sessions began. 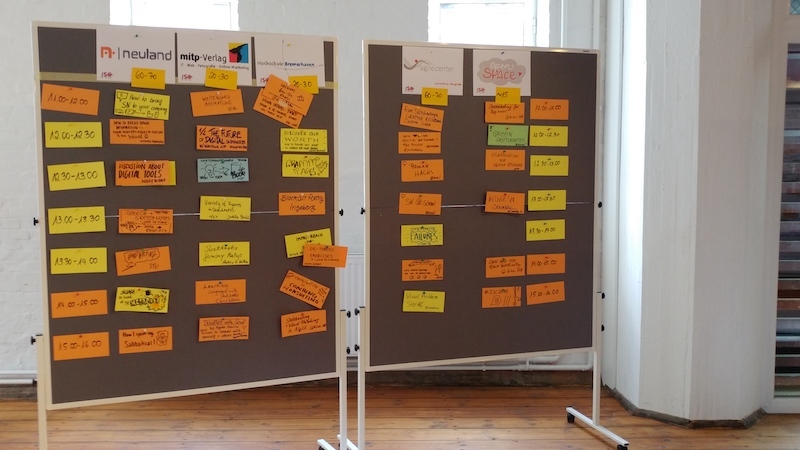 The schedule was full of inspiring workshops, discussions, and exchange of tipps. What I found really interesting was the session about whiteboard animation. 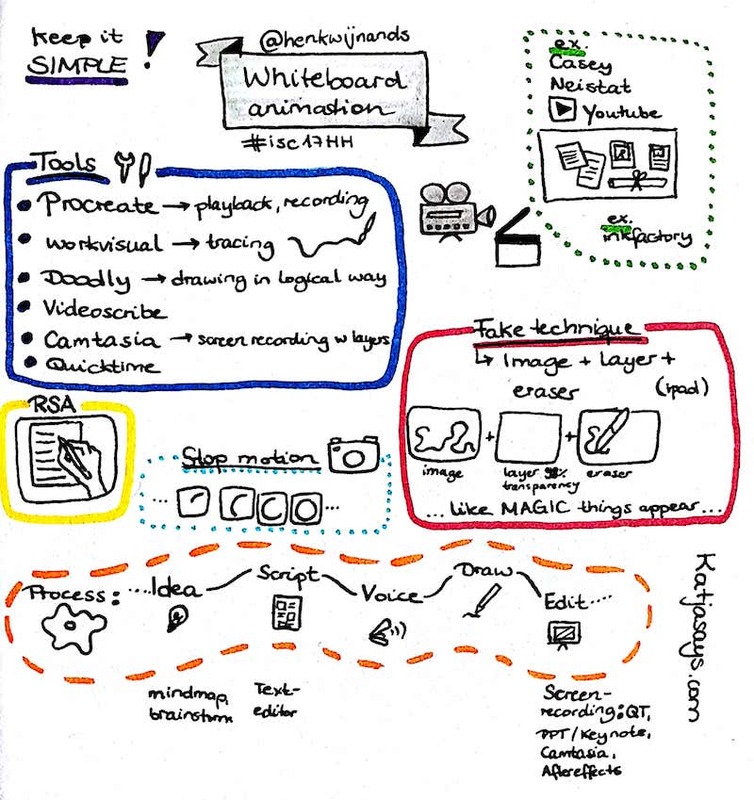 Apparently there are a lot of different tools to animate your sketchnotes and I definitely want to try it one day. A challenge every sketchnoter has to face at one point is how to shorten information. 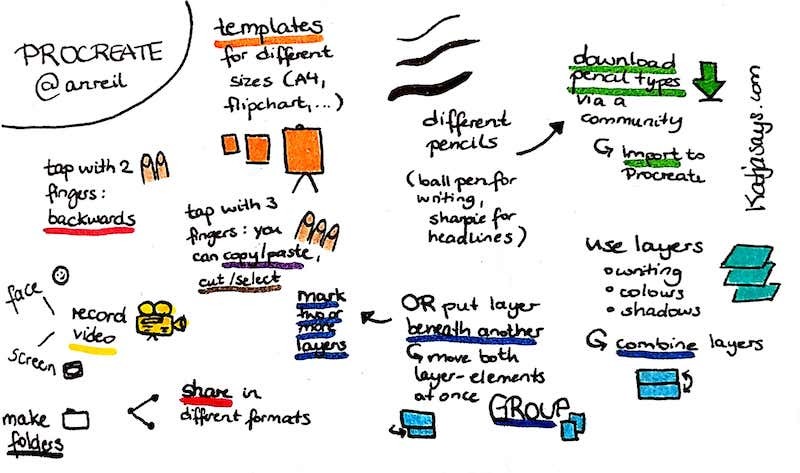 What if you have a client, who gives you a pdf with several pages that you have to put into one sketchnote? 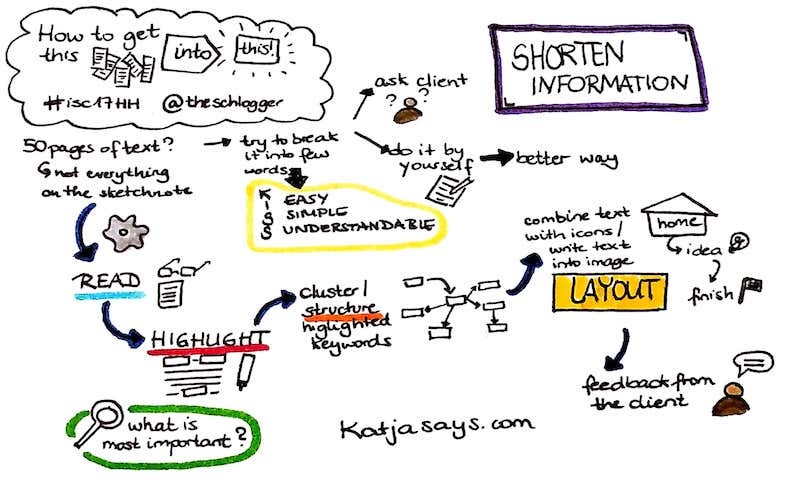 Johanna Baumann (known as Schlogger said that first you should read the document, highlight the important keywords/points, cluster and structure the highlighted keywords and then think about the layout (text and images/icons). For those of you who use Procreate, the session from Andrea Reil would have been very interesting. Here Andrea and the audience exchanged their tipps and hacks to use the program. 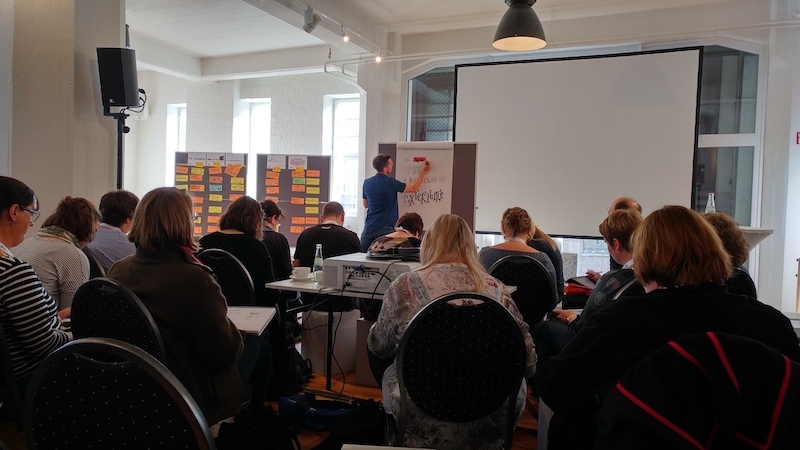 Other workshops were about topics like how to use sketchnotes in school, human resources or as a coach, what digital tools can be used for sketchnoting, how to teach sketchnoting, handwriting and more topics. 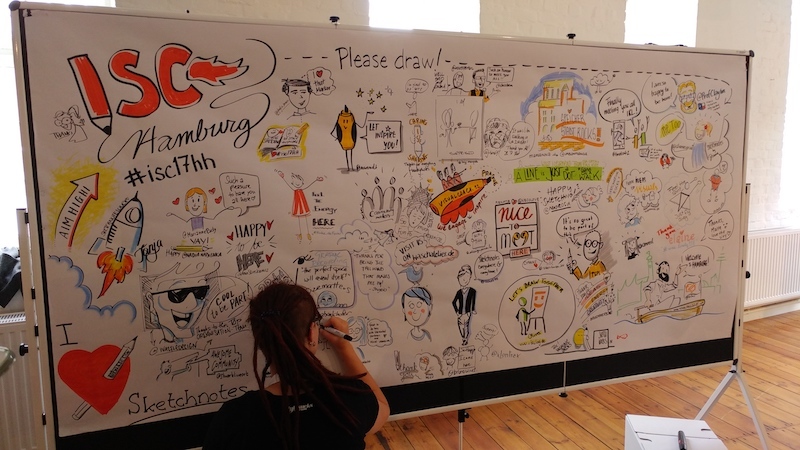 Apart from the sessions, there was a huge wall on which everybody could draw or write something. In the end there were a lot of nice impressions on the wall. 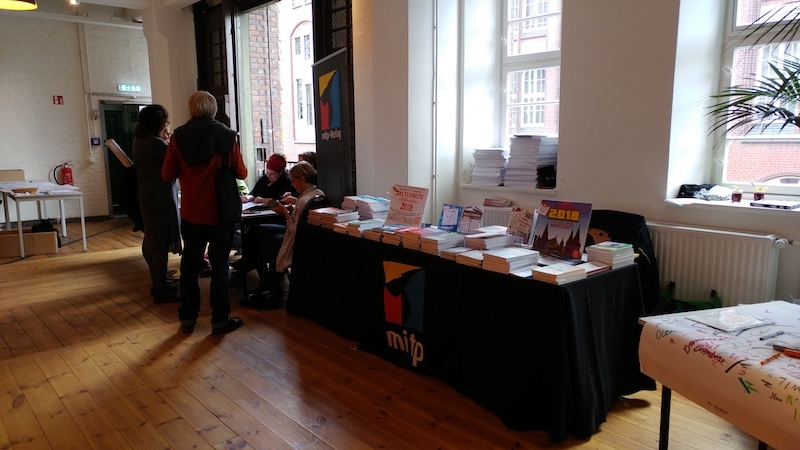 From time to time there was a book signing, where you could get an autograph for example from Mike Rhode or Tanja Wehr and you had the possibility to buy some books. 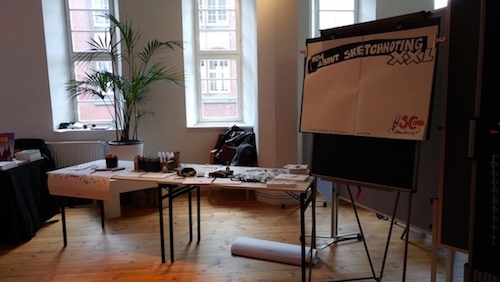 Neuland, one of the sponsors, was there and it was possible to try their pens (which are absolutely amazing!). 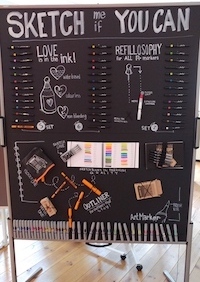 Also they showed a lot of their products and I think a lot of the participants will buy some of Neuland’s products. 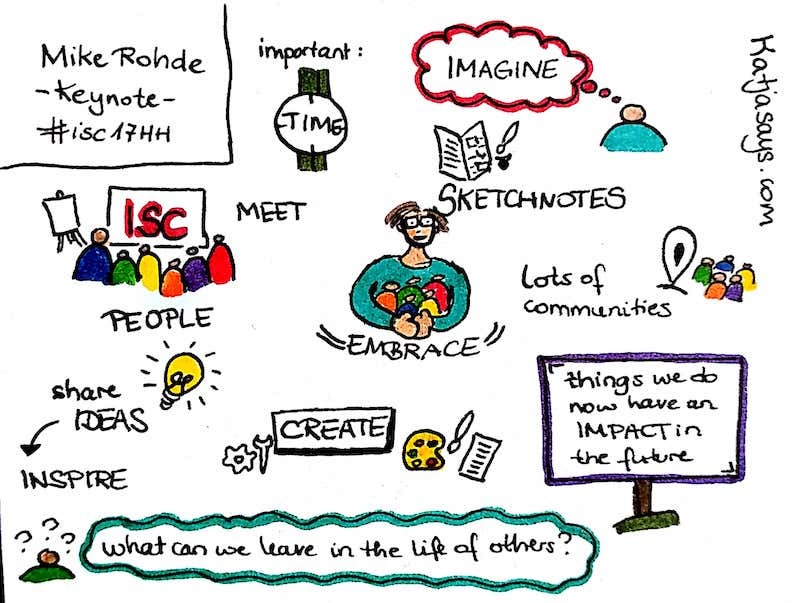 I really loved the sketchnote camp and I was happy to see all the sketchnoters in person and to get to know their tipps and learn from their experience. I am very much looking forward to the next sketchnote camp which apparently will take place in Lisbon. Hi Katja. Looking forward to meet you in Lisbon. Thanks.